Jeep Arch, located only 15 minutes from Moab, Utah is one of the many amazing arches this area has to offer hikers. 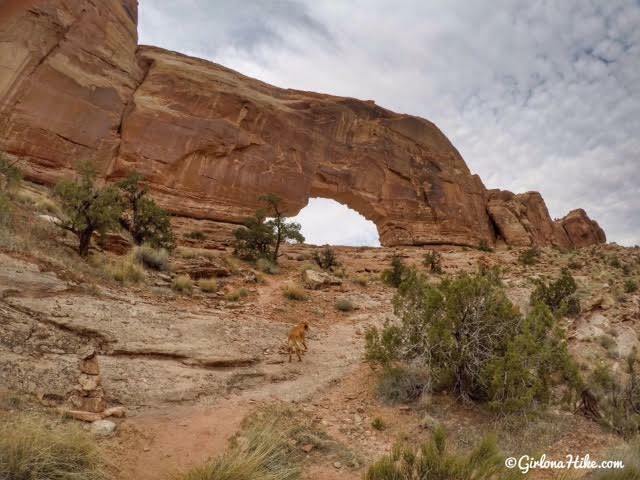 It's neighbor, Corona Arch, sees thousands of people a year yet Jeep Arch is a mere 0.3 miles down the same road and sees way less people. 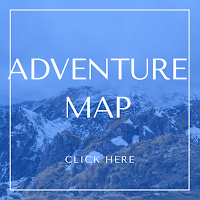 From it's name, you'd think it's a stop along the annual Jeep Safari routes, however no motorized vehicles (nor mountain bikes) are allowed on this trail. 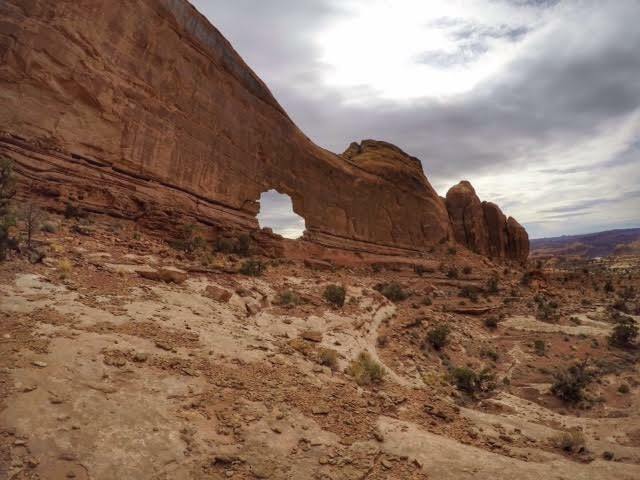 The arch got its name for the resemblance of a cut out of a cartoonish Jeep built into the natural sandstone. 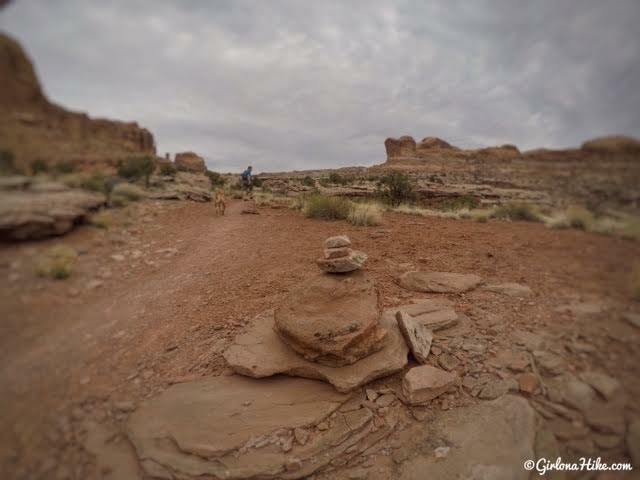 The trail is lead by cairns and only two signs. While it's hard to keep from staring at the amazing tall, red rock, slick rock, and peering into Culvert Canyon, keep your eyes on the path so you don't miss the cairns that will lead you to Jeep Arch. 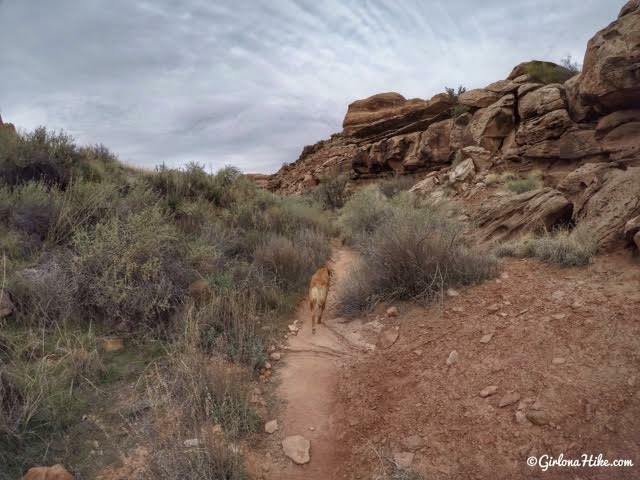 Dogs are allowed on this trail. 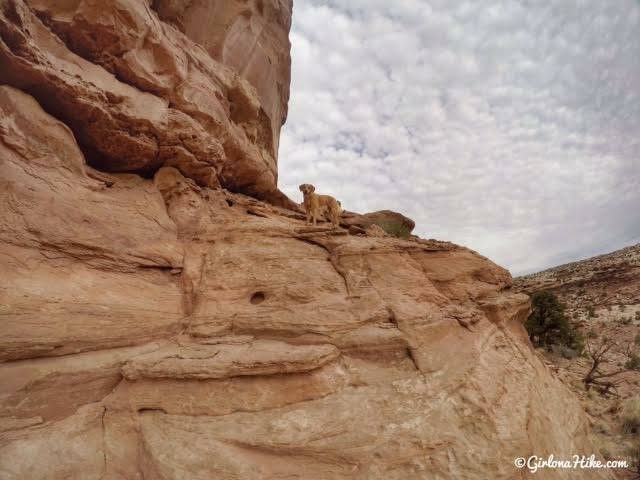 There is a sign that says this area is breeding grounds for big horn sheep and that dogs must be leashed. However, nobody does leash their dogs. Keep a leash handy in case you come across wildlife. There is no shade along this trail so bring plenty of water for you and your pup. Even in March we were sweating on this trail, so it's a good idea to start early to beat the heat. 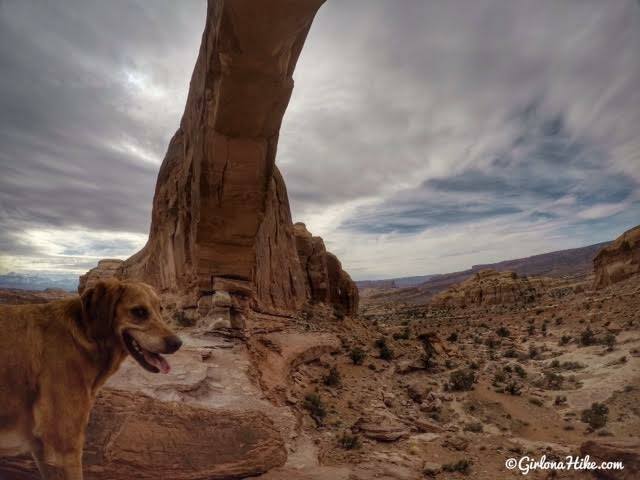 If it's too hot, please don't bring your dogs - the slickrock and sand heats up quickly and can burn their paws. 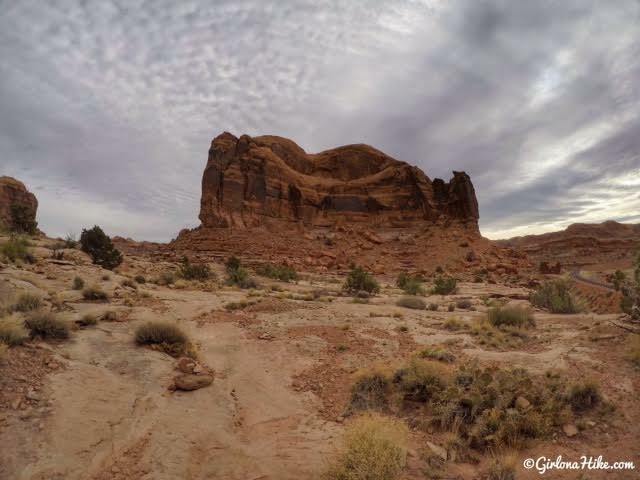 From Moab, head North on HWY 191, then turn left onto Potash Road. 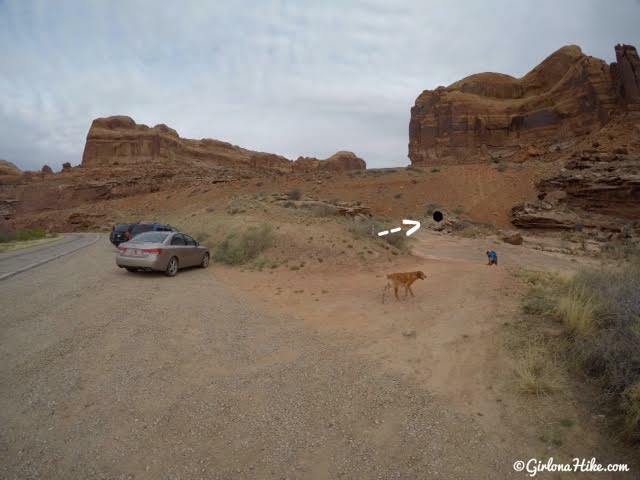 Drive 10.3 miles (0.3 miles past the Corona Arch TH) and park at the pull out on your right side. The parking area can fit about 10 cars. There is NO trailhead sign. Here's a driving map. The parking area is on the right side (East) of Hwy 279 (Potash Rd). 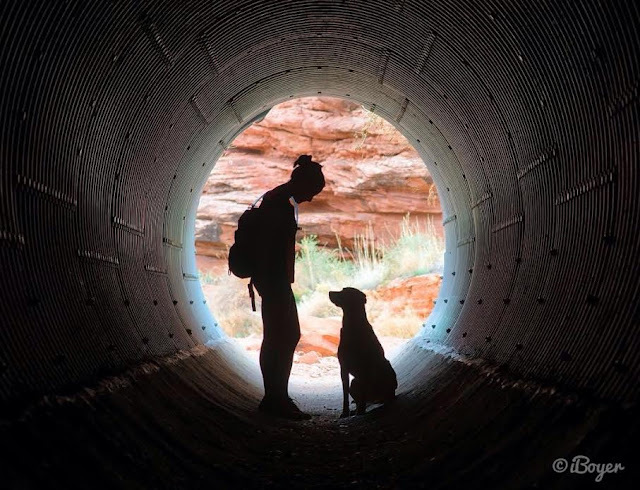 The trail begins by hiking through the tunnel, under the railroad track. 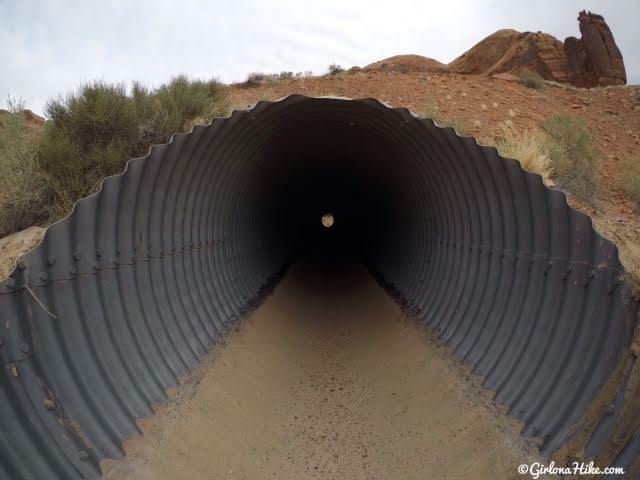 Though it looks small here, the tunnel is actually about 7-8 feet high, 4-5 feet wide, and roughly 150-200 ft long. Having fun posing in the tunnel. 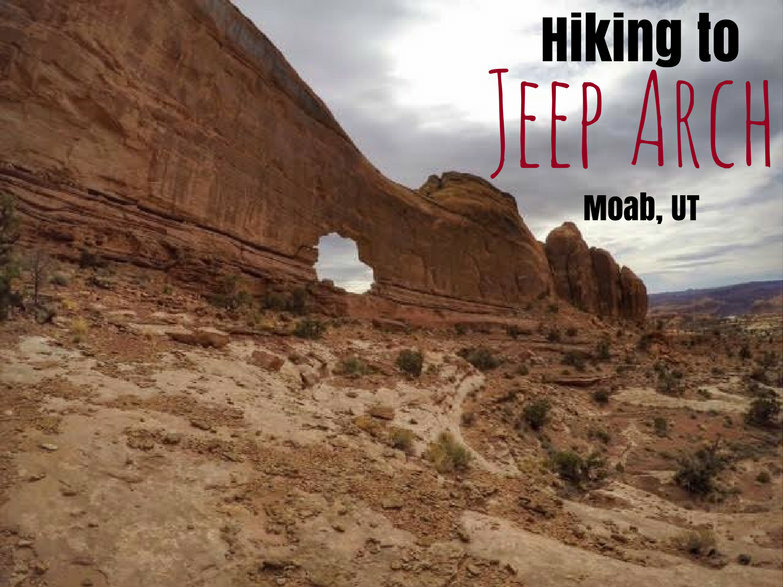 As soon as you exit the tunnel, you'll see the first and only sign for Jeep Arch - head left and up the short hill. 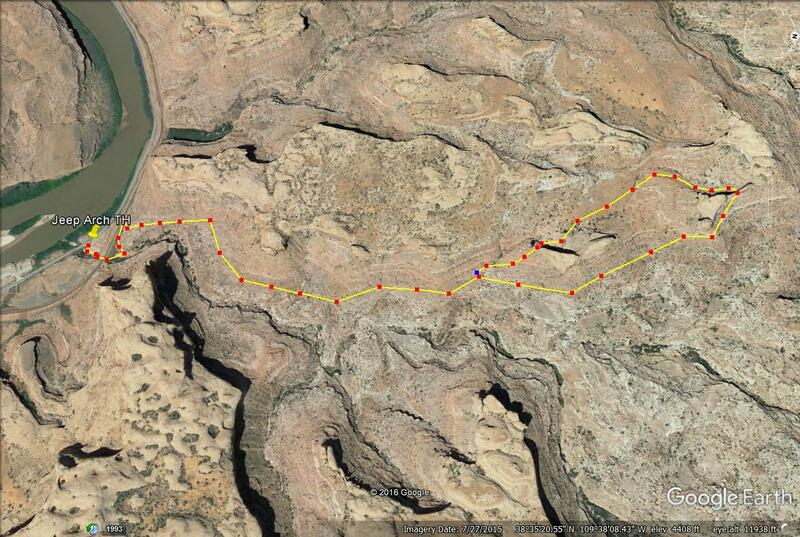 You'll hike alongside the railroad track and cut through sage brush. You should see a sharp right turn heading up another hill past an old barbed wire fence. 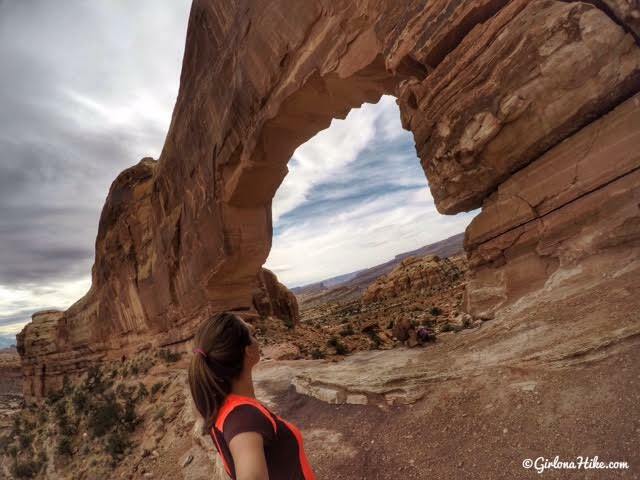 Enjoying the view of the massive red rock! 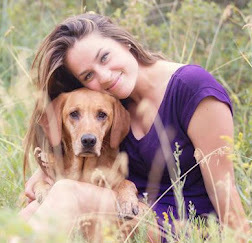 As soon as you pass the barbed wire fence, start keeping an eye out for cairns to guide you. 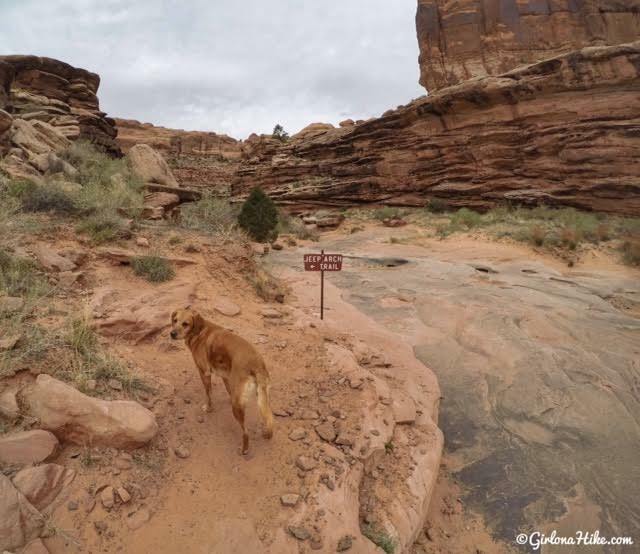 The trail is a mix of slick rock, sandstone, and sand. Eventually you'll reach another sign that says "Loop" - we chose to hike in a counterclockwise direction. 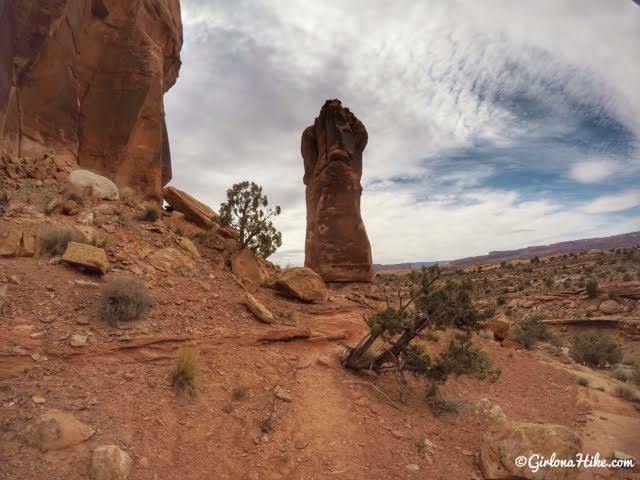 The trail takes you to the right of that spire and around to Jeep Arch. Hike up this small rocky area. 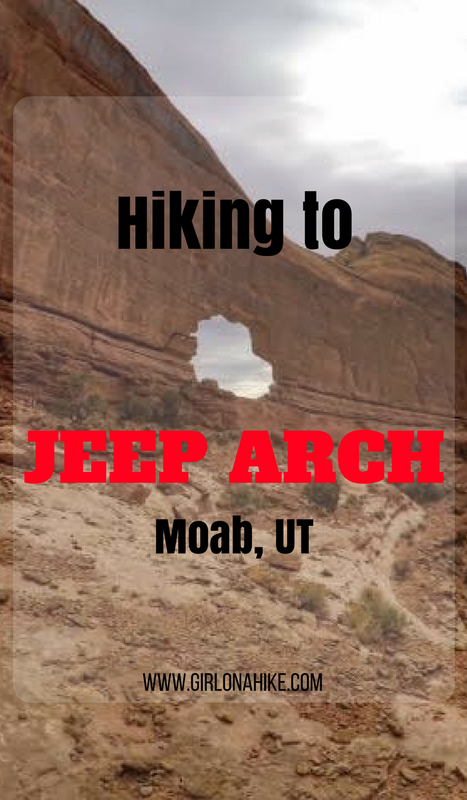 As soon as you turn the corner of that rocky area, you should see Jeep Arch to the left! 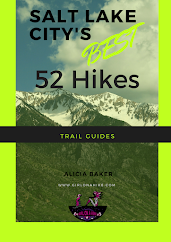 When you are ready to head back, follow the cairns back to the main trail, creating a loop. 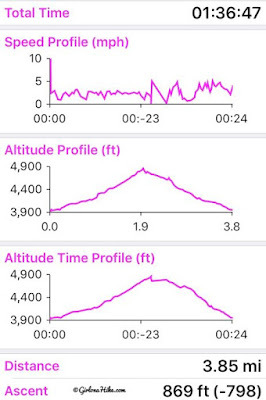 You should once again pass by the tall spire, this time hiking down right in front of it. 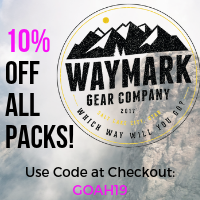 Make your way back to the cars the same way you hiked in. 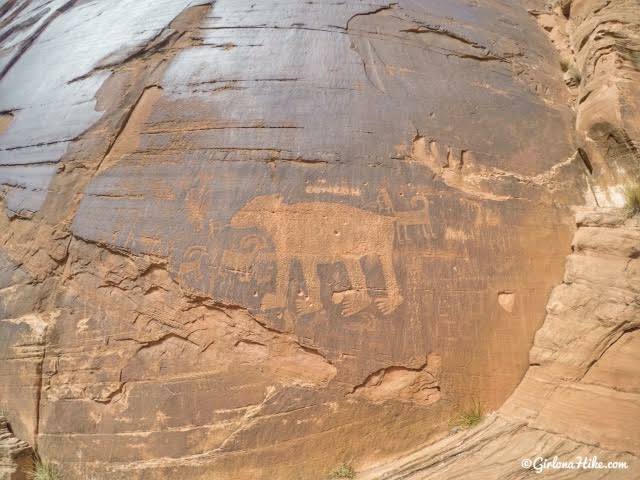 This isn't on the trail to Jeep Arch, but if you have time, stop along Potash Rd to view petroglphys. This is called "Bear Panel", and the paws are the size of my hand! This was near mile marker 6 or 7. 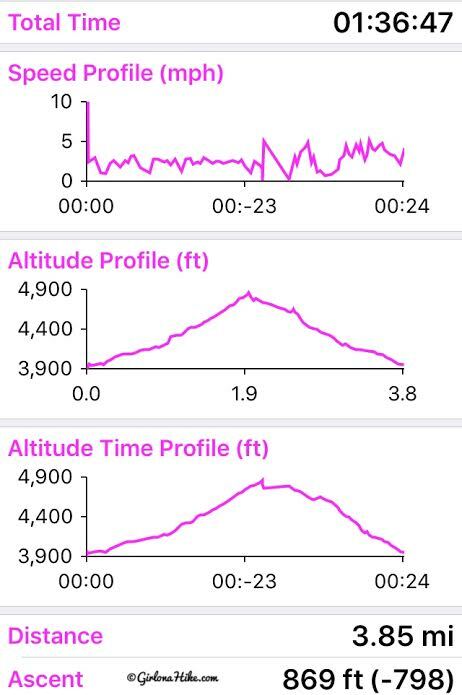 My trail stats via Gaia GPS. 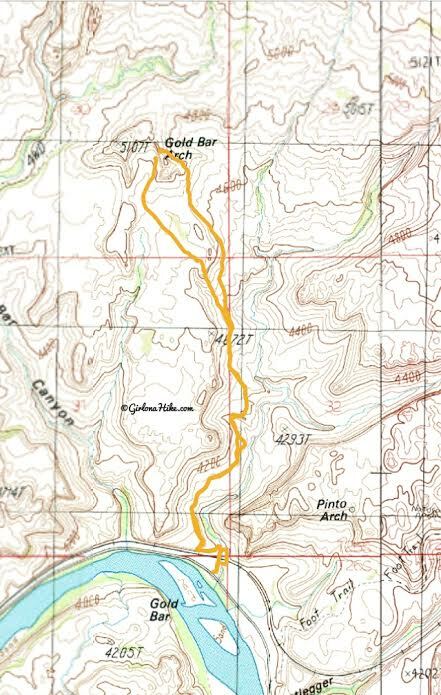 In older books and maps, you make see Jeep Arch labeled as Gold Bar Arch. 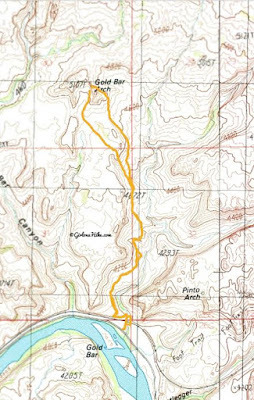 This was it's original name, as Gold Bar is a large sandbar in the middle of the Colorado River. There is a campground available on a first serve-first come basis, as well as reservable group camp sites. 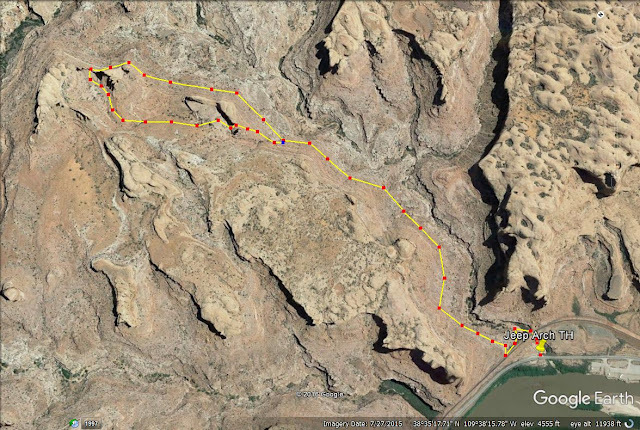 Jeep Arch trail map looking NE. Jeep Arch trail map looking West. Save & Share me on Pinterest! Awesome! Yes, he's a good boy and always checks on his mama! Hiked it yesterday. Awesome. Only ran into 10 other humans. Much better than Corona in that respect. 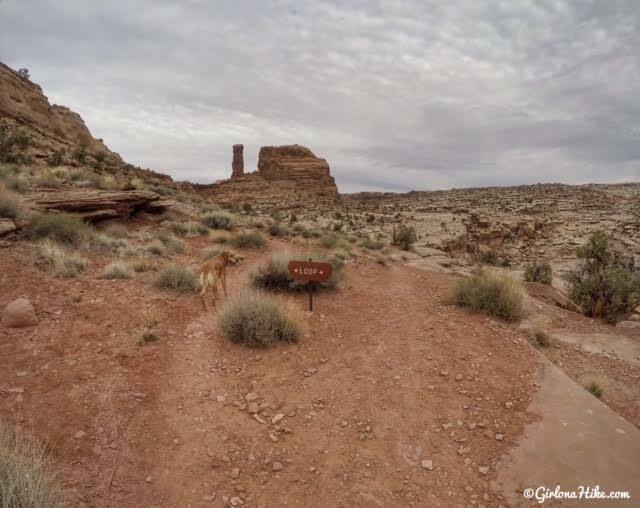 I would suggest proceeding clockwise at the loop junction sign as it's easier to scramble up over the butte with the spire which lies ahead than down it. Once you reach the arch from that direction it's a bit of a minor scramble up the left side of the approach. It's not well marked but another hiker passed on beta in that regard. 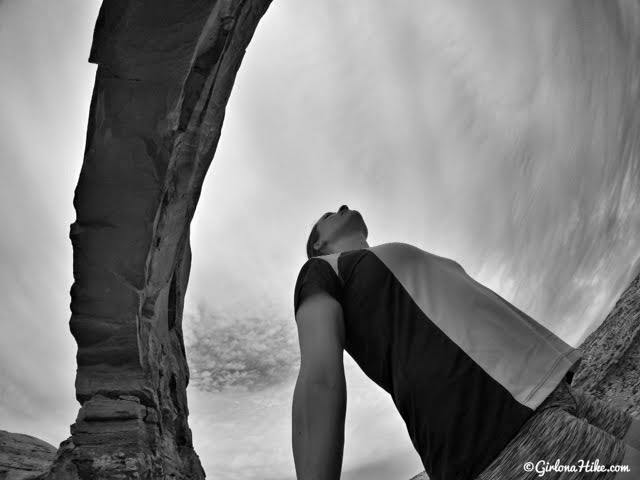 The view standing under the arch is incredible as are all the vistas on this hike. Once thru the arch just watch your steps heading down. We are in our mid 60's n no issues. 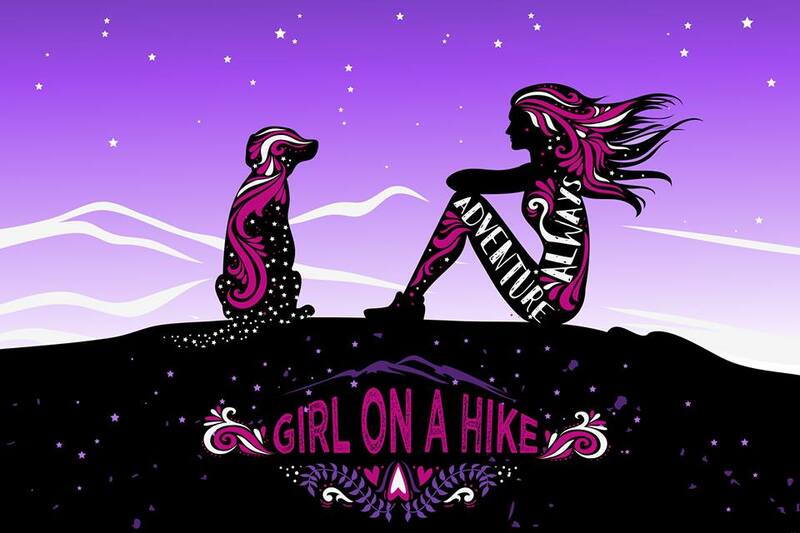 Fabulous solitude this hike.